For years, IT companies and their clients have been working against each other. Something breaks, the IT company comes out to fix it, followed by a big bill. But we at Ditechsol Inc we make sure things don’t even get down at the first place. We work on our products with extreme delicacy and avoid any ambiguity ending up in a clean and elegant product for your organisation. You have an business which comprises of many departments and each department has many people who work in those departments, many tools and applications to work on and further few more people who work on these tools and applications. Above all you have different database to manage. To handle most of these components is not only time consuming but can be a tedious and complex task. So what do we do? The solution is rather simple. Lets automate and integrate all the processes and processing of the data/ information. While we do that, we should be able to customize the whole system per our needs as and when required. Additionally, should enable us to get a real-time view of the data so that we can address any concerns proactively and drive improvements. Let’s make it scalable too with minimum cost and efforts possible. With more human interactivity, higher efficiencies of tools and application, better integration with each other and bringing all of it at one place we can achieve what we intend to. You can look at your organization where you always wanted to see it. So the crux is, lets minimize all the variances. Do What You Do Best: Get more time to focus on core business. A professional IT services provider can find the new technology as well as implement the solutions much quicker, allowing you to Focus on your core competencies. Productivity: Get a higher rate of efficiency from technology. 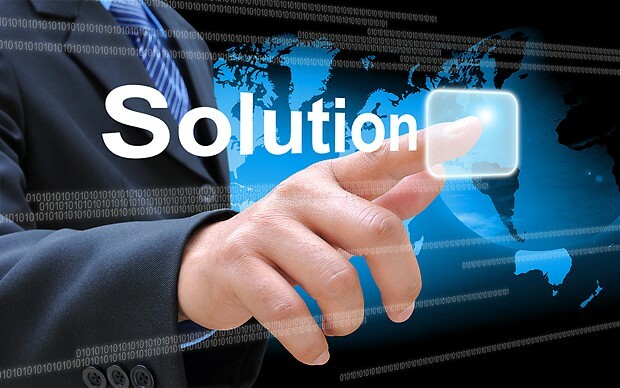 An IT solutions provider will help to set up a solution that works for your staff, ultimately allowing them to use the new technologies/ solutions that will increase their work output and productivity. The Competitive Edge: Get ahead of the pack. Speed and agility are two elements your business needs across the board. Now, especially significant in the case of computing, your business can take advantage of new technologies and solutions that will help your business obtain a competitive advantage. Reduce Operating Costs: Get smarter spending. The value found in a smarter IT solutions for your business operations translates to hard money savings. Also, a technology services provider can help to plan and control budgets in any area of the business operation, which also helps identify future bottom-line savings. Having accumulated vast expertise in designing & implementing various software products, our specialized team of product architects infuses their skills together and provide the best architecture and database design. Our custom software development services help clients build and integrate sophisticated business applications and/or websites with client server and legacy systems. We create and deploy robust, scalable and extensible architectures for use in a wide range of industries. We work very closely with client’s in-house IT personnel to jointly analyze, design, develop, test, implement, and integrate with new systems. A key facet of this offering is to provide staff augmentation and bridge the gaps where all the internal IT department needs assistance. There are multiple benefits of Cloud computing.